So, this is the first shot of one of the three Photoshop Courses run over the last week. 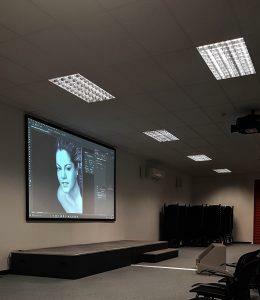 It was an Advanced Photoshop Course with elements plucked from the Photoshop Intermediate Course and delivered to a design team and the companies product photographer. With onsite training all room set ups are unique and depends on the amount of delegates attending the course. It can be run from one persons desk as a 121 session to a full room set up as shown below. This tailored course was organised for four people in a room that already contained a projector which was a bonus for your’s truly however its not really necessary as I have a portable projector which can be bought in for the day. The laptops are pre-installed with the software so its just really a matter of ‘power up and train’. There really is nothing to it, all that’s needed from you is the room & electric sockets and to let me know at the time of booking which software version you are using. This probably has to be the largest screen and room I’ve delivered training in EVAH and over the years I’ve trained in some huge spaces. This was a Photoshop session which was part of a customised Adobe MasterClass course held in North Wales, near Flint during August 2017. 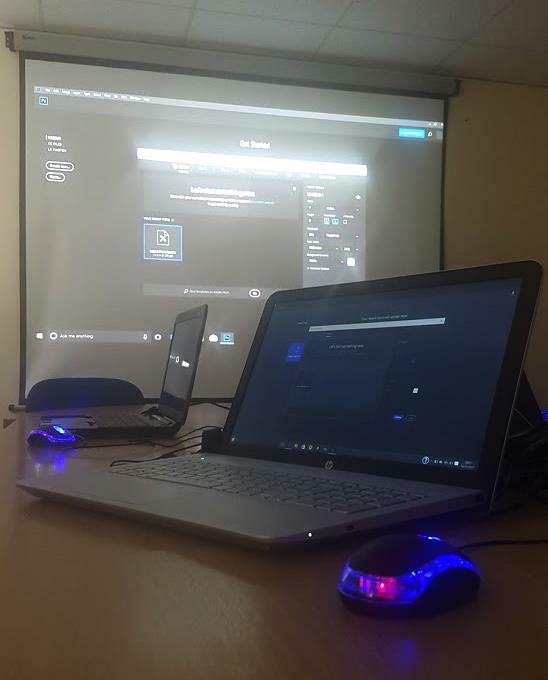 It was run for a large food retailer who supplied the training room whilst I provided the laptops. The content of this completely tailored and customised MasterClass was proposed by the client, the course content then designed by me and between the studio manager and myself delivered successfully to the product design teams over the six days.